Even to seasoned listeners, “jazz harp” might sound like a risky proposition. The phrase may call to mind Alice Coltrane or Dorothy Ashby, but more likely than not, it may remind us of the countless lesser attempts to copy the sound of the two women who most famously tried to assert the instrument as one capable of playing good jazz music. 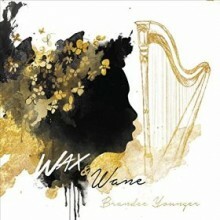 While it will be up to the history books to judge the importance of Brandee Younger’s latest release, Wax & Wane, the album certainly sounds like a fresh interpretation of the role that the instrument can play in contemporary jazz. Younger is accompanied by a fairly standard combo, made up of Dana Hawkins (drums), Dezron Douglas (electric bass), Mark Whitfield (guitar), Chelsea Baratz (tenor sax), and flutist Anne Drummond, each of whom is an accomplished performer in his or her own right. Younger’s strong choice of side musicians is a large part of the sturdy groundwork that she laid for this album’s best moments. While this record at times gestures to “pretty sounding harp” cliches, Wax & Wane does not rely upon the lush instrumental textures that one may expect from a band led by a harpist. While the evocations of chamber music are the strongest on “Ruby Echo,” other tracks on this album pull more heavily from funk, grooving steadily along throughout the disc’s 7 tracks. On “Soul Vibrations,” the album’s introductory cut, the excellent jazz guitarist Mark Whitfield opens the record with wah-wah guitar flavored heavily by the musical legacy of Shaft. Dezron Douglas anchors “Afro Harping” in a subtle but funky bass groove. On both of these cuts, Younger plays in a manner more typical of feedback-oriented electric guitar textures than swirling harp arpeggios. While the album’s title track tilts a bit more slick and polished than this reviewer would prefer, this ultimately comes down to a matter of taste; even though it sounds like smooth jazz, it sounds like good smooth jazz. Overall, the playing on this album is anything but typical. Rrather, like the better efforts of Younger’s musical forebears Ashby and Coltrane, Wax & Wane asserts a number of possibilities for more fully including the harp in the canon of jazz instruments. This entry was posted in Jazz and tagged 2016, 2016 Releases, black music, Brandee Younger, Harp, Jazz, Jazz Harp, Matthew alley, Revive, Wax & Wane by aaamc. Bookmark the permalink.